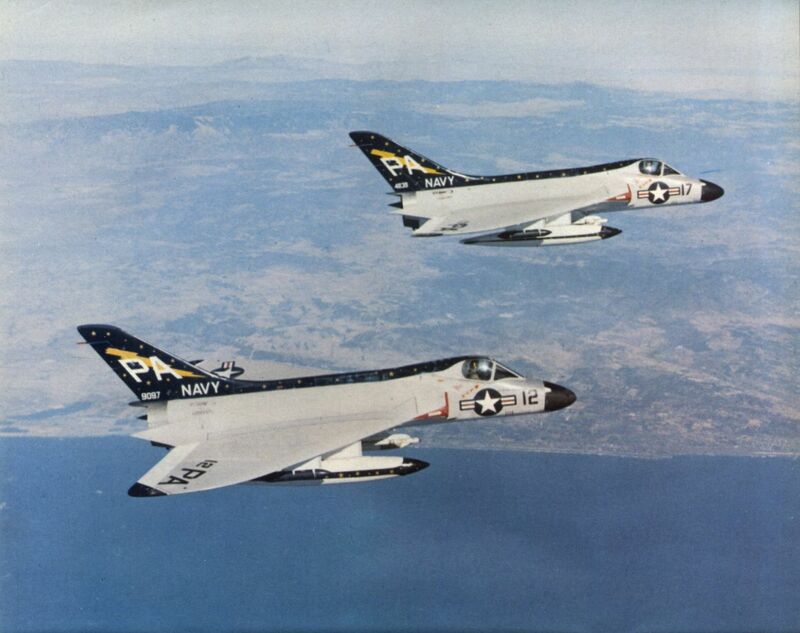 F4D-1s of VF(AW)-3, operating as part of North American Air Defence Command (NORAD), over Southern California in 1959. Further shots of 124587 over California in October 1953. This aircraft had a sliding cockpit canopy instead of the clamshell type of the first machine. 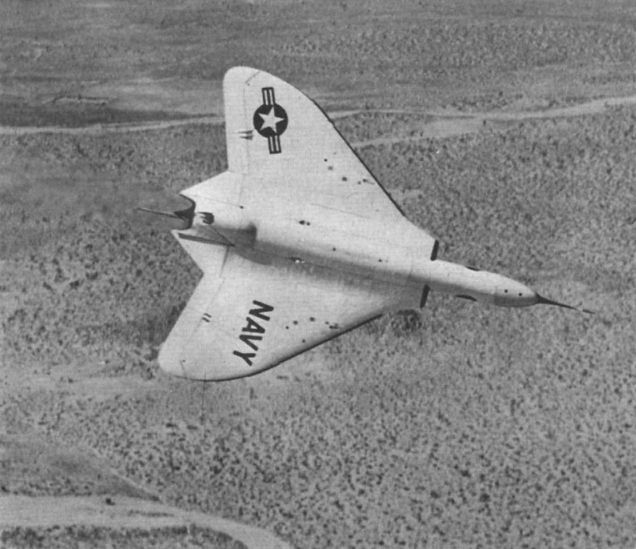 The second XF4D-1, 124587, shows off its planform over the Californian desert in October 1953, the month it set two world speed records after an afterburner-equipped J40 engine had been installed. 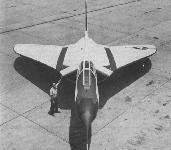 An early production F4D-1, 134752, with its intake modified to include the splitter plate but as yet unpainted. The pod contained navigation avionics. 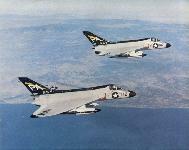 Four Skyrays of VMF(AW)-115, flying from the USS Independence (CVA-62) in the Mediterranean as part of Carrier Air Group Seven, March 1963. 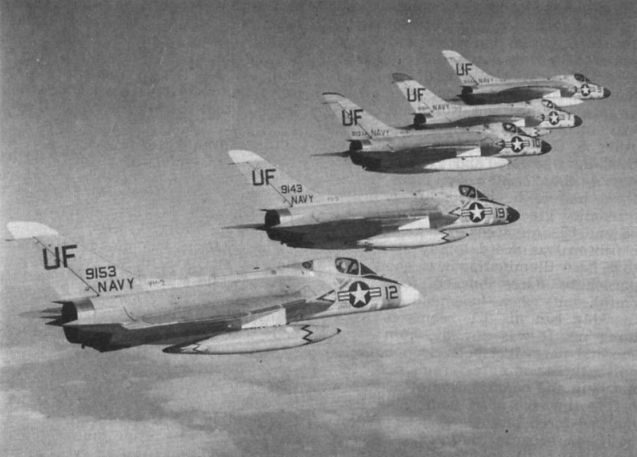 A group of F-6A’s of VU-3 in echelon, January 1964. 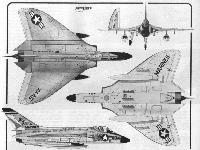 After replacement by F-4s in Carrier Air Groups, “Fords” were used by the Utility Squadron providing target and other services to fleet units. F4D-1 134802 of the Fleet Air Gunnery Unit at El Centro, California, fires a rocket from a pack on an out¬board pylon in February 1958. F4D-1 134819 of VF-101, one of the early East Coast Skyray squadrons, carrying a tow target in 1957. 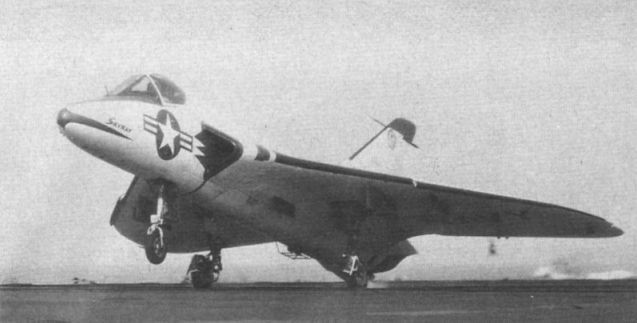 The first XF4D-1, 124586, touches down on the USS Coral Sea during initial carrier trials on October 20, 1953. A white finish with red trim replaces the original glossy sea blue, and a movie camera is carried beneath the fuselage. The first F4D-1 Skyray, 130740, photographed at El Segundo in July 1954. 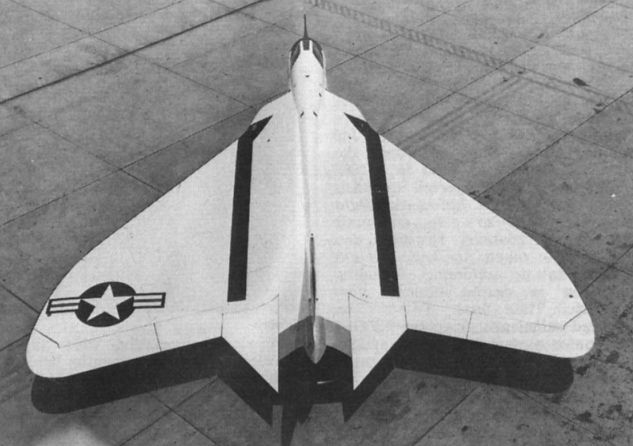 Another view of 130740, showing the production Skyray’s distinctive plan-form, two-section elevons, pitch trimmers and revised tail cone. 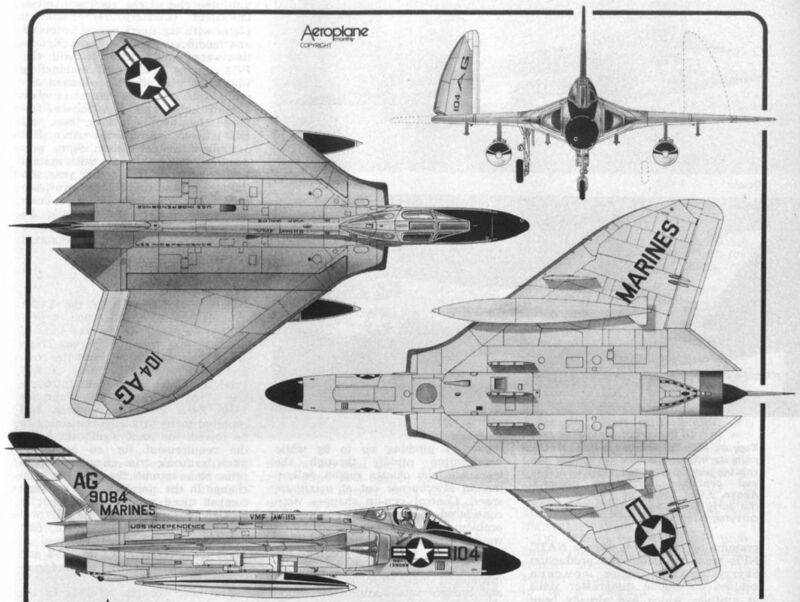 The fourth F4D-1, 130743, was rolled out at El Segundo in December 1954 with glossy sea blue finish, and initially had a production radome nose. Skyrays of VMF(AW)-115 pose for their portrait with personnel and ground equipment in 1960. With its afterburner lit, F4D-1 130746 rotates for take-off at the Naval Air Test Center, Patuxent River, in January 1956, during build-up to carrier trials.